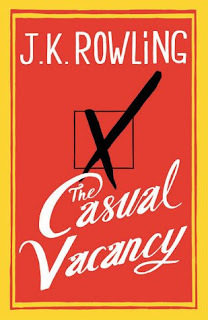 The Compulsive Reader: The Casual Vacancy Has a Cover! I don't like it, but ... I can understand why they went this way. This is not a book cover so much as it is an icon, a logo, a symbol. It's distinctive, and you'll be able to know who's reading this book from well across the room. Smart of them! Still, did it have to be ... soooo ... blerg? It does have a vintage feel, as you say, but I'm not wild over the color scheme! Still, looking forward to the book. ...oh, wait, the intention was to separate The Casual Vacancy from the Potter-verse? I don't have any problems with the cover, mostly because I'm just squee that she's writing another book. Plus it's an adult book, so this cover sets it apart from Potter...And I also agree with Dalya Moon, the point is probably visibility over everything else.